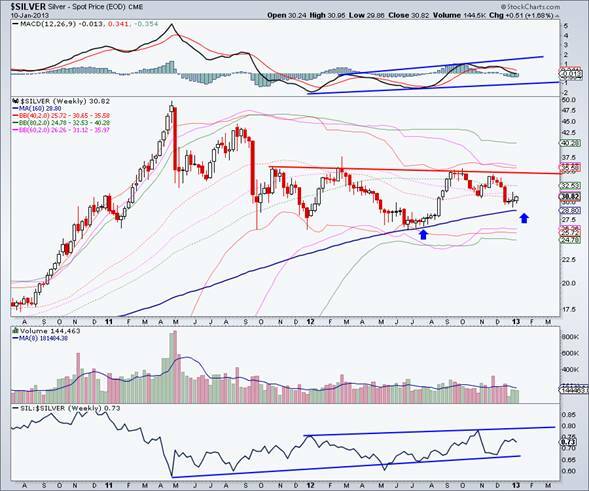 This analysis is excerpted from part of yesterday’s subscriber update in which we presented our outlook for Gold, Silver and GDX/HUI. When making forecasts and writing outlooks, analysts must look at a multitude of things. We usually begin by examining the macro landscape via intermarket analysis. How are the various markets trending? Which are lagging? 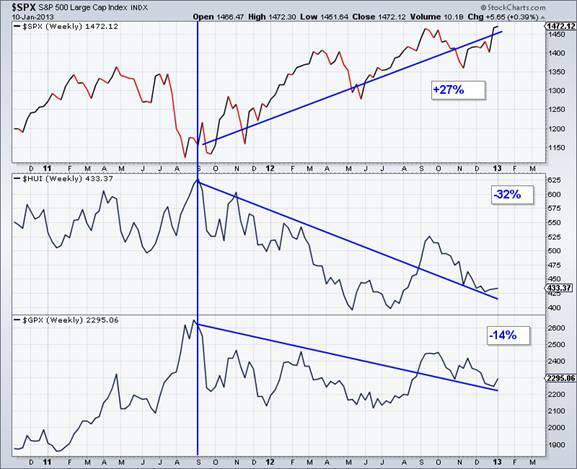 Where are the divergences? As we begin 2013, there has been an important shift in regards to precious metals that few analysts have picked up on. The rest of our analysis filters down from this discovery. We are speaking of the decoupling that has taken place between the equity market and the precious metals complex. This is significant because it began nearly 17 months ago. (Decouplings of three or six months are not significant). Since the Euro crisis in summer 2011, the equity market has rallied nearly 30% and reached a five-year high. During the Euro crisis both Gold and gold shares were trading at all-time highs. GPX, an index of precious metals prices, was at an all time high. Since that time, the gold stocks are down by more than 30%. This is what a decoupling looks like. It’s not obvious over short periods but over long periods of time. This decoupling means that precious metals cannot begin an impulsive sustained bull move if the equity market continues to move higher. The equity market has to struggle with resistance and begin a mild cyclical bear move. While over the near-term precious metals can confirm a higher low, the 2013 success of the sector depends on the struggles of conventional stocks. What would make stocks struggle? That is where the fundamentals come into play. At present, capital is moving out of bonds and into stocks. The consensus conventional view for 2013 is one of continued growth with a chance of increase but no threat of inflation. Yet, if interest rates rise the debt burden would increase dramatically due to the current huge debt load but low cost of service. If the cost of servicing $15 Trillion in debt is 2%, then a rise to 3% equates to an extra $150 Billion in interest expense. In other words, interest rates cannot be allowed to rise materially. At somepoint rising interest rates would become bullish for precious metals and bearish for the stock market. Moreover, if interest rates cannot effectively be managed downward, then that would be even more bullish for precious metals and bearish for conventional assets like bonds and stocks. Its important to note that both the economy and the equity market have little margin for error. The economy has picked up statistically in recent quarters and is getting some help from emerging markets. Yet, it is only churning along (like a camel in the desert) due to massive deficits and continuous debt monetization. At the same time, the equity market (S&P 500) is now at a five-year high and very close to massive resistance. In any event, it is very clear that the decoupling will continue. You must decide if and when the markets will shift. Turning to the technical outlook, we find Gold well entrenched in a consolidation. While momentum is turning higher, Gold is unlikely to breakout anytime soon due to the strong resistance at $1750-$1800. If Gold is able to firm up here and now then it has a good shot to rally back to $1750-$1800 over the next few months. If we get the bullish scenario and a fundamental catalyst shift then expect Gold to break past $1800 in Q3. 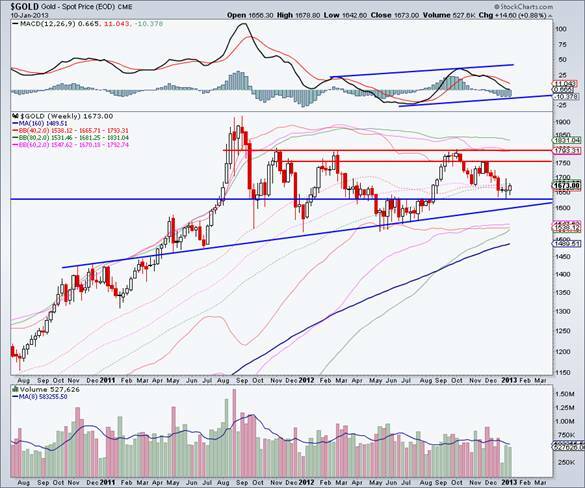 That would mean that Gold consolidated for two years which would be its longest consolidation on record. The longer the consolidation, the more explosive the breakout. A breakout in the second half of 2013 (with momentum already rising) would bode extremely well for 2014. Silver is in a much larger and slower consolidation. It will take longer to evolve but eventually build stronger momentum than Gold. The initial upside target is obviously $35. 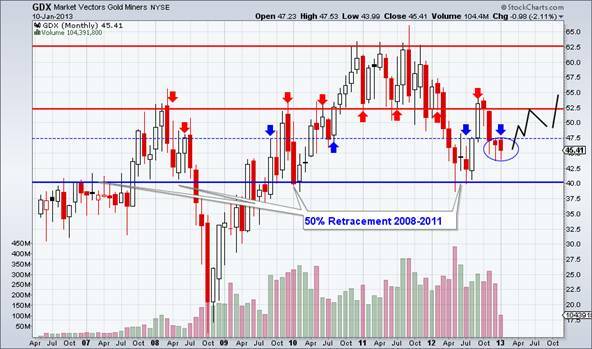 Assuming Gold breaks past $1800-$1900 then Silver should break past $35 and at least test $44, the August 2011 high. It is very encouraging to see the silver stocks outperforming Silver (bottom row). Turning to the shares, we love the clarity from the monthly candle chart. It details just how important the key levels are. Note the strength of support at $40. In addition, we see that while the market has been weak, it has failed to close below $45 in each of the past three months. If GDX is able to close at or above $46 this month then we believe the secondary bottom is in. In that case, look for GDX to test $52 (extremely important pivot point). As we’ve written in recent updates, the $52-$55 area for GDX stands between the current market and an impulsive advance that could last a few years. Over the short-term it appears that the gold stocks are forming rounding bottoms. These are slow bottoms that take time to form. At the same time, the action in Gold and Silver is looking more and more constructive. Generally speaking, we see precious metals starting the year well and potentially finishing the year very well. However, do realize that while this could be the low for 2013, it could be many months before precious metals experience their next breakout. Conventional investments still have momentum and it will take some time for that relationship to shift. The bad news is, you are going to have to continue to be patient. The good news is we see this being the most explosive breakout since 2005 and you have plenty of time to try and identify the mining stocks poised to be big winners when this cyclical bull begins in earnest. If you’d be interested in professional guidance in uncovering the producers and explorers poised for big gains then we invite you to learn more about our service.